Enjoy yourself in a fun, safe, caring and supportive environment. Workshops for children, adults, families, groups and more. Hand building, wheel work, paint your own pottery, private times for families, friends, plus commission work. There are many resources and equipment for you to use. There is a small gallery and shop for locals and tourists. Buy local handmade @ Clay Koala. Clay is wonderful! A lump of clay can be transformed into an object "hand made by you". Come and chill out! We all need time to create. Clay Koala is my start-up business. We have renovated a large shed with air conditioning, off street parking, level access in quiet creative space. 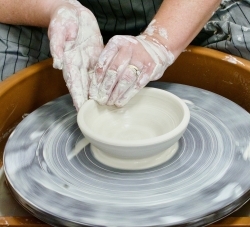 Staff have experience working in pottery/ceramics. Working with Children checks and background checks. I have completed Child protection courses, first aid, anaphylaxis and child safe modules, recognised by NSW Government office of Children Guardian.